JVC camera + JVC headphones = Incompatible hardware? 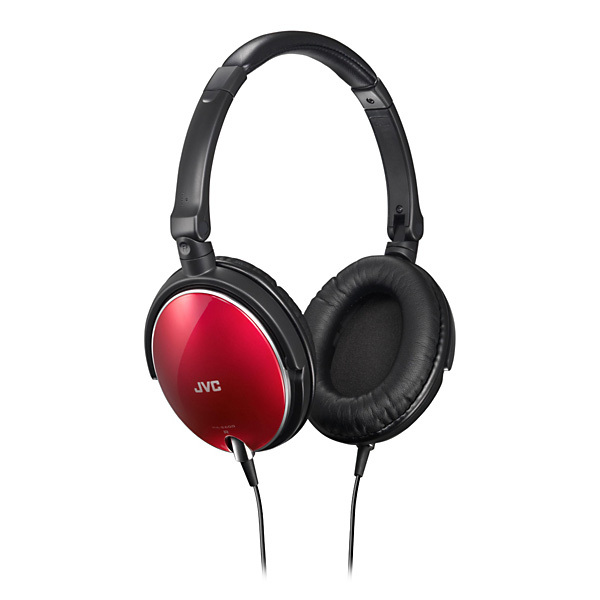 Topic: JVC camera + JVC headphones = Incompatible hardware? I'm not sure where to put this, but Media seemed like a good place. I have a JVC GZ-MC100 video camera with a headphone jack that seems to be too small for my JVC headphones to fit in it. You'd think that with them both being labeled JVC, they would work together. This is the camera I have. These headphones look very similar to the ones I use, mine are just a bit smaller. They have a standard size plug. Does my camera need some special kind of headphones? My dad used to work as a PC technician at my local university before he retired. He told me that not once in his life had he seen a camera that didn't support standard sized headphones. I noticed it has an SD card slot for storage. The videos are 720p and from what I've read, the file size of the videos is 1mb per minute. What size SD card should I go for?